This is an ongoing project as I continue to search for detail of Wally's time spent in Bomber Command. If you feel you can assist me in any way or recognize anyone in any of the photographs please contact me at any time.I would be pleased to here from any relatives of the crew who were in ED995 PH-X on the fateful night of 8th October 1943.The crew consisted of Sgt R A Collins, Sgt W J Adamson, Sgt P M Adams, Sgt P J Bemrose (only survivor) Sgt S V Watson, Sgt R Mallin, Sgt J Strachin. As I have been building this site it has become even more apparent to me of the sacrifice given by more than 55,000 members of Bomber Command who lost their lives during World War Two and I, like many others cannot understand why a campaign medal has not been awarded to all who served. On a single night Bomber Command lost more aircrew than Fighter Command lost during the Battle of Britain, yet the flow of volunteers never faltered. The bravery and courage of all who served with Bomber Command should never be forgotten. Equally we now have a better understanding of the stress and mental fatigue faced by all in the forefront of a major conflict, so isn't it time we reviewed all who were accused of LMF? Surely this would today be treated as a nervous breakdown and viewed more sympathetically! Through the foresight and assistance of my darling daughter Melanie-Jayne this web site is a dedication to my dad our hero, but is also a tribute to all who served with Bomber Command, and I am eternally grateful to all the people in both 12 and 463 squadrons who helped Wally to over come all the odds and survive where so many were far less fortunate. It is only through your bravery and sacrifice that we are here today. Thank you all. “There are no words with which I can do justice to the Air crew who fought under my command. There is no parallel in warfare to such courage over so prolonged a period of danger which at times was so great that scarcely one man in three would expect to survive his tour of thirty operations. Of those who did survive between six and seven thousand undertook a second. It was moreover a clear and highly conscious courage by which this risk was taken with calm forethought, for air crew were all highly skilled men much above average in education, who had to understand every aspect and detail of their task"
The planting of this tree not only preserves dads memory but also helped towards the funding of the museum in the old control tower. 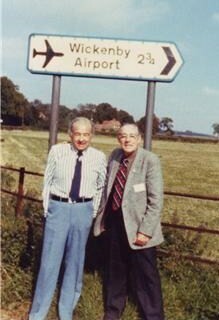 The museum and the Wickenby 12 and 626 squadron web site is run purely by volunteers to whom I am most grateful for all there fantastic help in keeping the memory of all who served at Wickenby alive. Please visit their web site at www.rafwmm.flyer.co.uk and don't forget to visit the museum! In constructing and compiling this web site I have been helped and supported by many people, to list them all is an impossibility but without the following I could not have even begun this task that at times makes me incredibly sad and full of despair but in the main is very rewarding. I have also helped to form friendships with many wonderful people worldwide. Jim Tattersall the son of my father's Bomb Aimer, thanks Jim for the photographs, documents and support. All at Wickenby Airfield your help and assistance has been fantastic. My new friend Carl Ryan, your friendship is immeasurable. 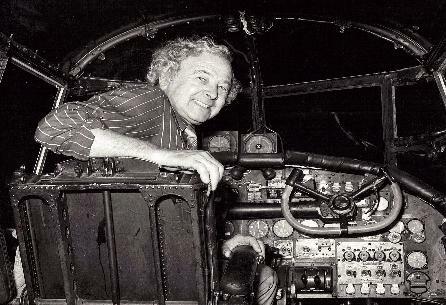 The first link is a audio taken from the crew of a Lancaster during a raid on Berlin on September 3rd 1943 a raid that saw Wally complete his 24th Sostie!